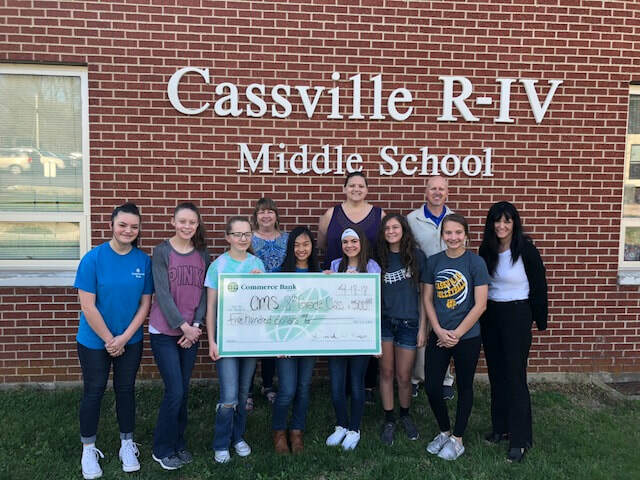 Commerce Bank and Commerce Bancshares Foundation recently made a donation to the Cassville Middle School for the 8th grade promotion event. Pictured above, from left to right, in the front row: Taylor Bredeson; Lexi Yockey; Elizabeth Ray; Natalie Johnson; Alyzea Meyers; Adryana Quinlan; Landry Parnell; and Michelle Pilant, from Commerce Bank. Back row: Sharon Sanders; Angela Seymour; and Jimmie Barton, CMS principal.